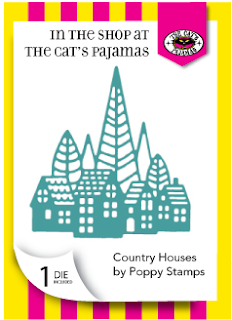 Now that you have your list ready from all the fabulous The Cat's Pajamas Stamps sneak peeks, the time has come for you to get everything on your wishlist! It's release and blog hop day to see more awesome creations the Cat Pack have put together. If you have arrived here from Kerri's blog, you are in the right place! If you did not, be sure to start here. For my first card, I am using the set of North Pole or Bust. 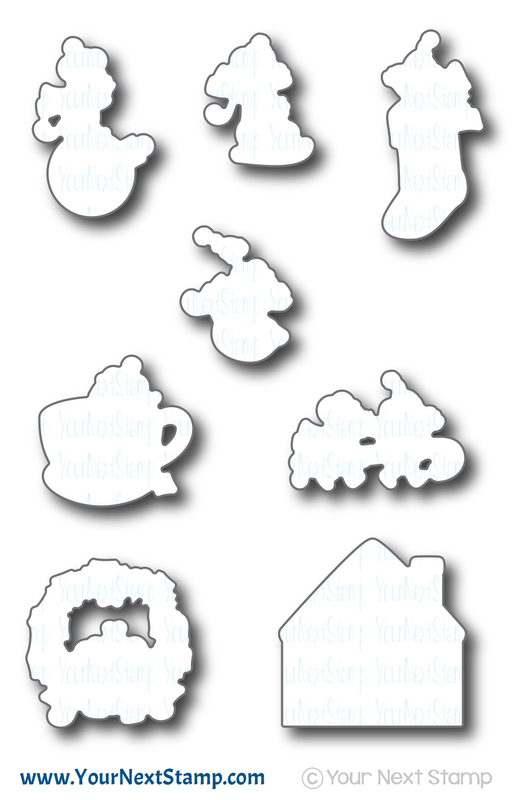 This set is SO adorable and it was hard to choose one image to use because they are all super cute. I started with a white card base and used the Ornament Cut Up to layer the new large 5 layer Snowflake Cut Up over it. I colored the cute image with Copics before fussy cutting it out to pop it over the center of the snowflake. Using some green ribbon, I created the look of it hanging down from the top and added a matching bow. 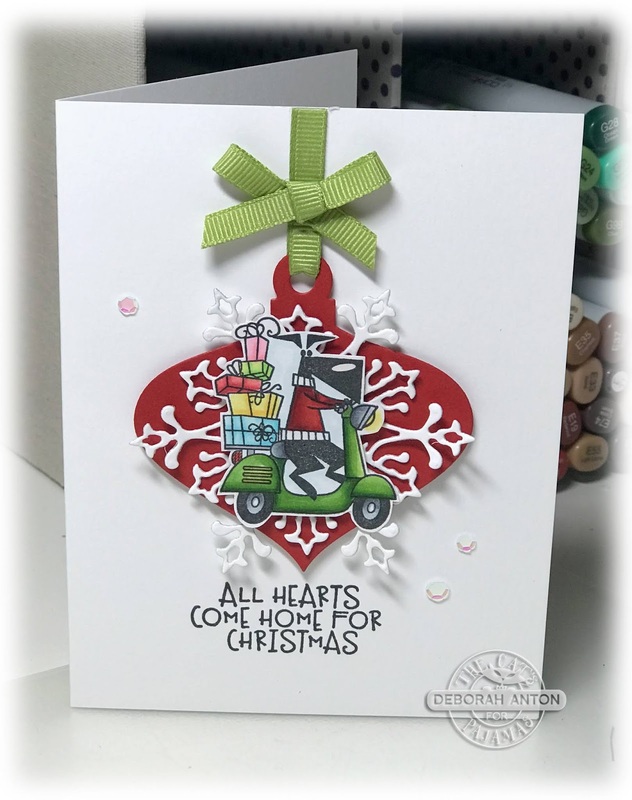 The ornament was then popped up as well in the center of the card and finished with the sentiment stamped directly onto the card base. A few fun sequins new to the TCP store were added to complete the look. 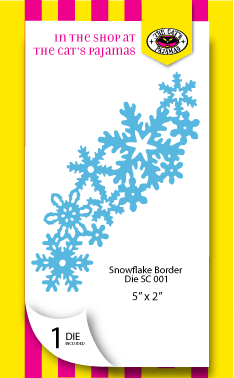 For this second card, I cut out of some white glitter cardstock with the new snowflake border die as the background to showcase this cute gnome from the new set of Gnome for the Holidays. Once the border background was added, I colored, cut, and popped up the cute gnome over it. The sentiment was stamped directly onto the card base and finished with some of the new sequins. 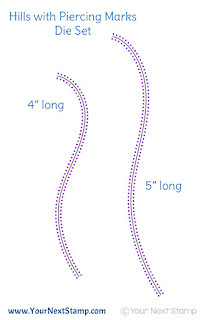 I love the look of some doodled lines along the edges and that was the attempted look I went for. However, I realized that doodling is not my thing! hahaha! Sometimes it works out well for me and other times (like this one) it does not. It is not terrible, but I will need to work on it. 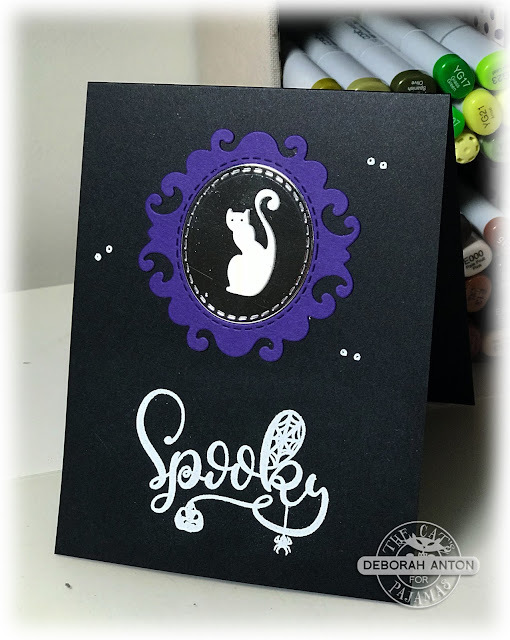 Thanks for hopping by and be sure to head on over to Lynn's blog to see more fun creations! October sneaky peeks have been happening this week with The Cat's Pajamas Stamps! 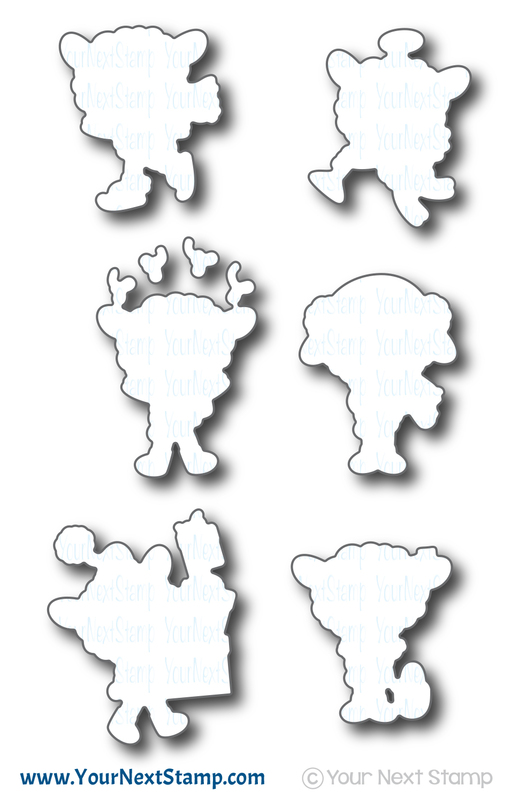 Have you stopped by and taken a look at all the amazing creations the cat pack has made so far? You won't be disappointed in seeing all the awesome projects nor will you be disappointed in this release. 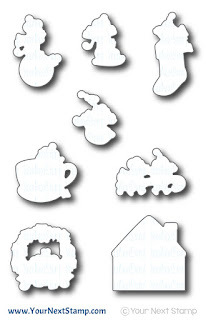 So many fun and punny stamps sets along with some super cool dies. 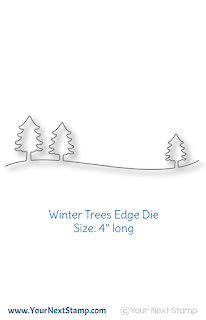 For my first card, I am using what will be the free die with purchase during this release and it is called the Village and Tree die. I decided to do a partial cut with the die and used my craft knife to create the box around it. Once the opening was made, I adhered a piece of vellum to the backside and layered behind that a piece of light blue cardstock. 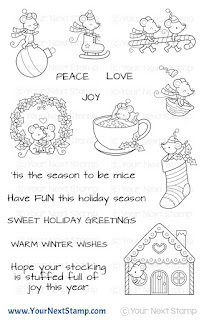 For the sentiment, I used the Seasons Greetings Cut Up to add to this simple card. Using the same color cardstock, I used some Deco Foil foam adhesive to cut out the sentiment so that it would have some dimension to it when placed on the card. I finished the card with some of the new sequins also being released. 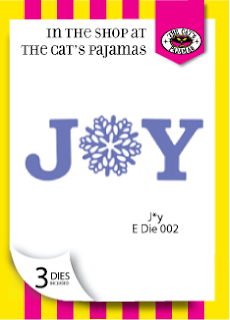 For my second card, I am using the new die of Joy to create this fun plaid word card. Simple, yet festive using this die with some plaid patterned paper. 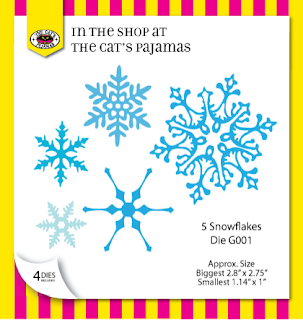 I popped up each letter and the snowflake for some added dimension. The snowflake was given a little glitter with my wink of stella pen for added sparkle and finished with some red sequins. I really like how this looks with the plaid. Are you in it to win it? Leave a comment either on either the Cat Packs' blog or Instagram accounts for your chance to win a $10 gift certificate to the TCP store. It's challenge 100 with Your Next Stamp and the DT have created some fabulous creations based on the challenge of Making a Scene. 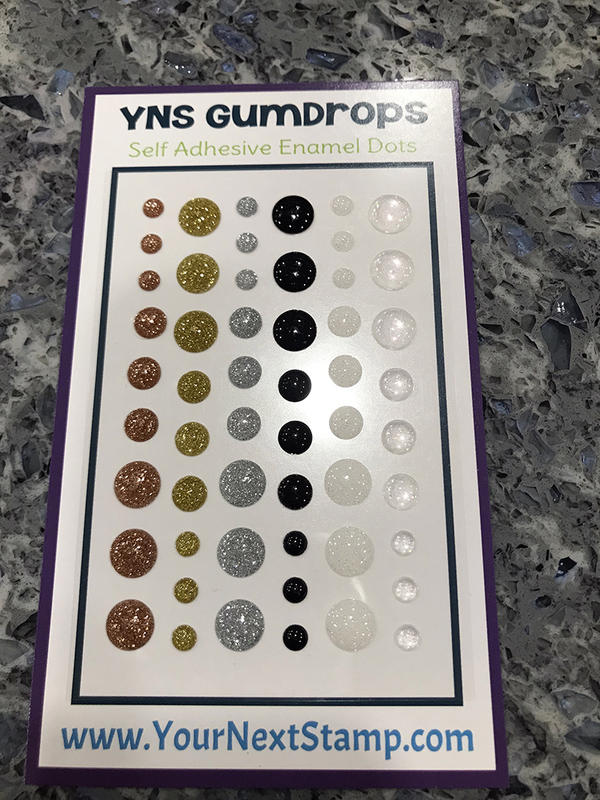 The YNS Store has so many awesome sets to make this challenge a breeze! Especially with this latest release. 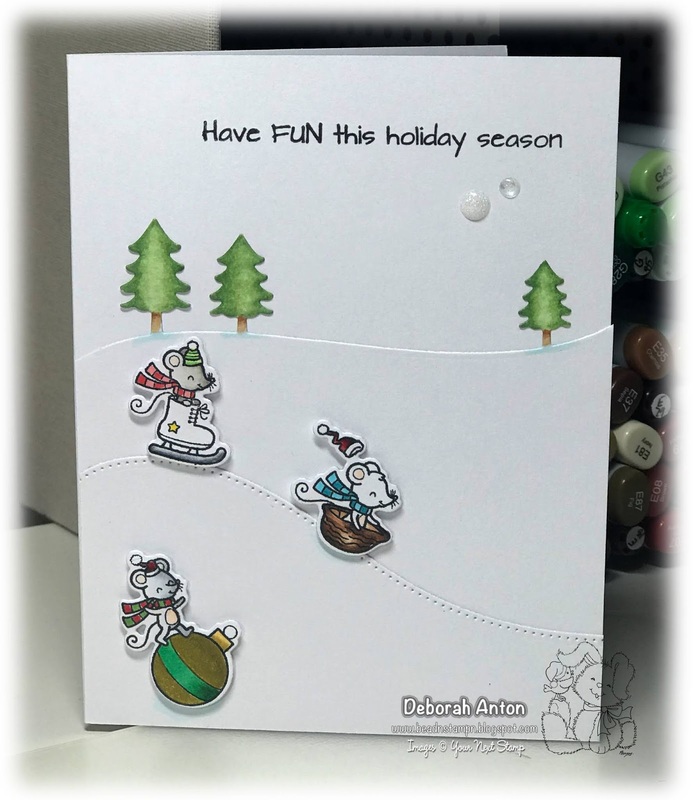 For my card, I am using the new set of Holiday Mice to create the fun these little guys are having. 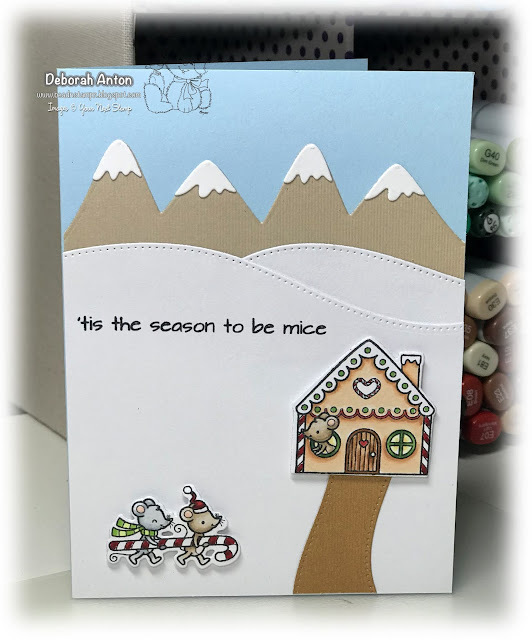 The background was created using the new Winter Trees Edge die and the Double Pierced Hill die. The images were colored with Copics and cut out with the coordinating die set. I popped up the images for some dimension and finished the card with the sentiment stamped directly onto the card base and a few sparkly gumdrops. 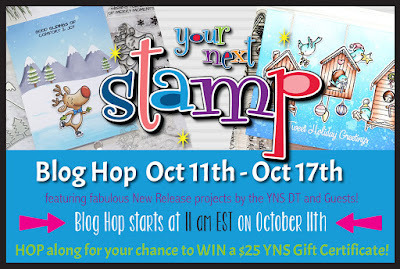 Be sure to stop by the YNS Blog to see all the DT creations! 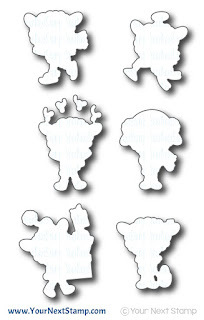 And don't forget to leave a little love for your chance to win a stamp set of your choice! Thanks for stopping by and hope you have a great weekend. 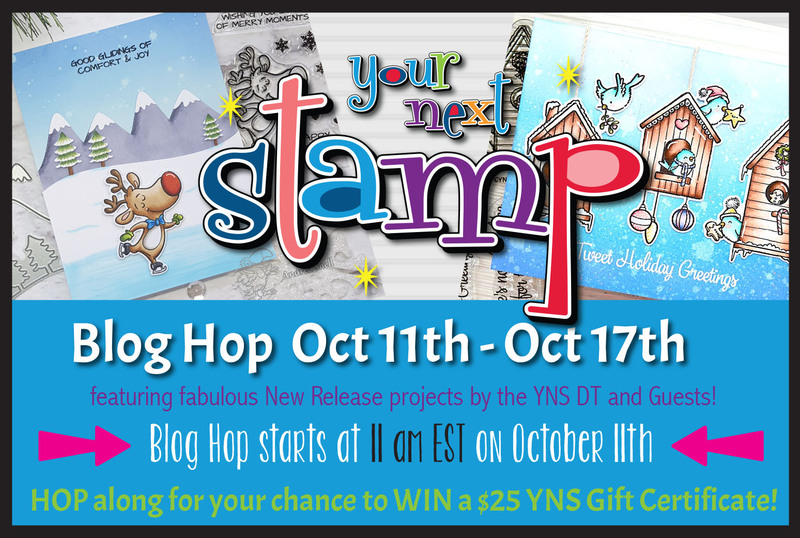 It's new release time and blog hop with Your Next Stamp! Weren't all the peeks awesome? The DT really showcased these new items perfectly and you can't help but get your holiday mojo going. But before you run out and purchase all those on your list, hop along to not only see more but leave a little love and you can have a chance to win a YNS gift certificate. 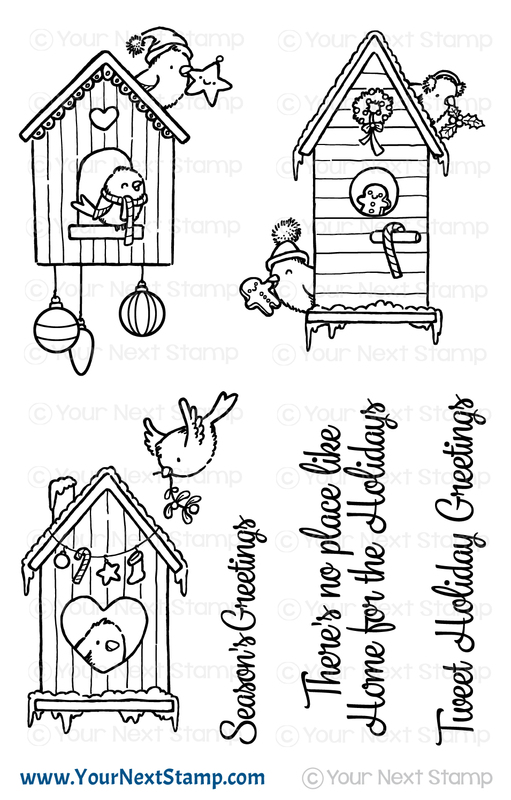 For my first card, I am using Home for the Holidays set to create this little bit of outdoorsy holiday card. I started with a cream cardstock base and colored in the image with Copics. I cut it out with the coordinating die set. 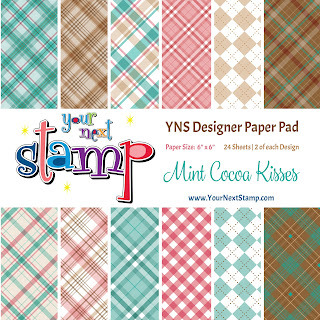 I used some of the new YNS paper collection of Mint Cocoa Kisses for the background before adding a cut out of the Pine Branch Die which I added a little snow to it using my white gel pen. The birdhouse was popped up around the branch and a small bow of twine and sparkly gumdrops were added to complete the card. 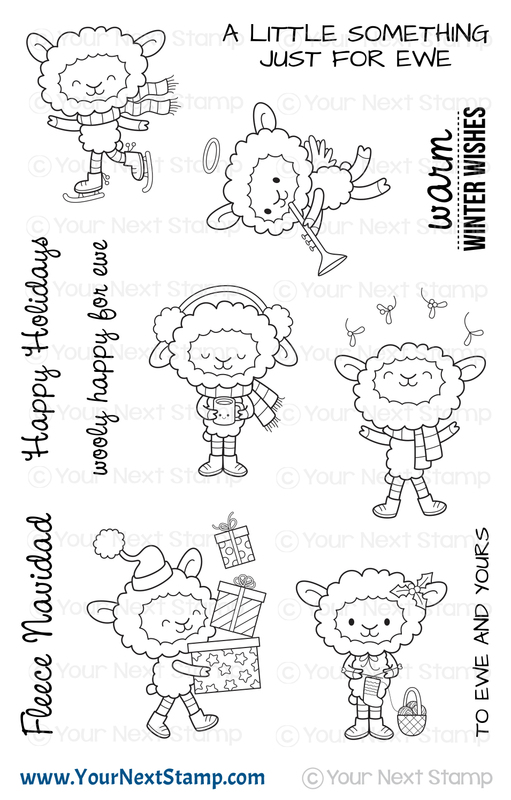 For my second card, I am using the fun set of Fleece Navidad. These little guys are so cute and the sentiments are perfect. 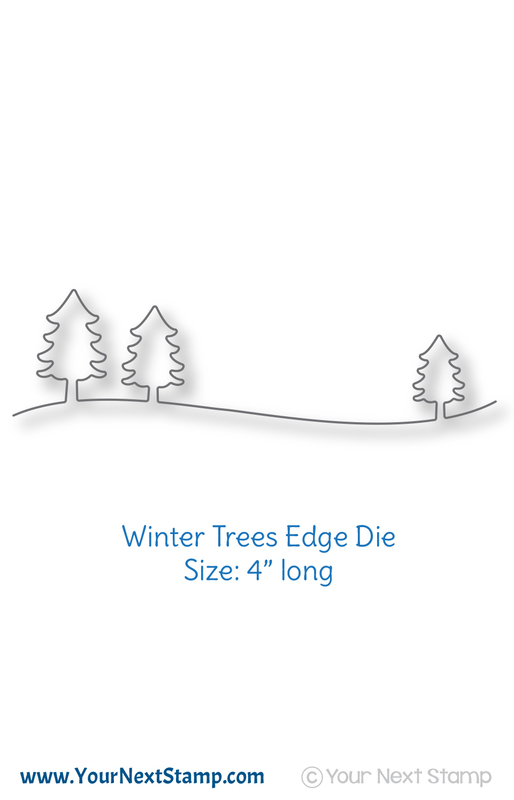 Of course, I had to make a little scene background which I did using the new Hills with Piercing Marks die and the Winter Trees edge die. This little guy is off to deliver a few presents and wish everyone a Fleece Navidad! As always, Karen has a wonderful sale for you to be able to pick up all your favorites during this release, so be sure to head over to YNS to grab them before they are sold out! Thanks for hopping by and have a great week! 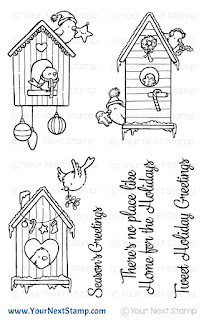 It's sneaky peek time with Your Next Stamp and it's one that will make you want to take out your sweaters and boots, ready for the colder weather. 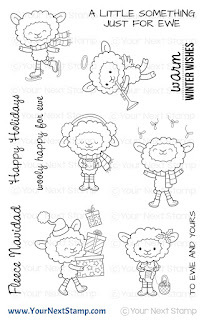 As always, it is packed with cuteness and dies to match ready for your holiday creativity. For my sneak, I made a card using the new set of Holiday Mice. These cuties are the perfect size for making some fun tags or matching card sets. 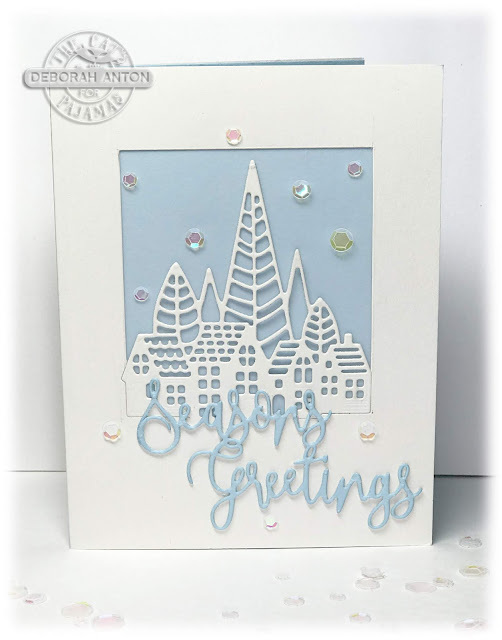 I started with a light blue cardstock for the base and added some snow hills using the Hills with Piercing marks die set. 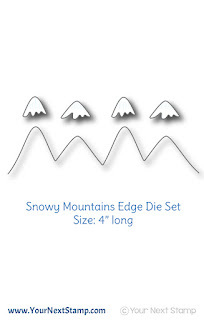 That was set against the Snowy Mountain Edge die (how fun is this?) to create a simple backdrop to the super cute mouse gingerbread home. 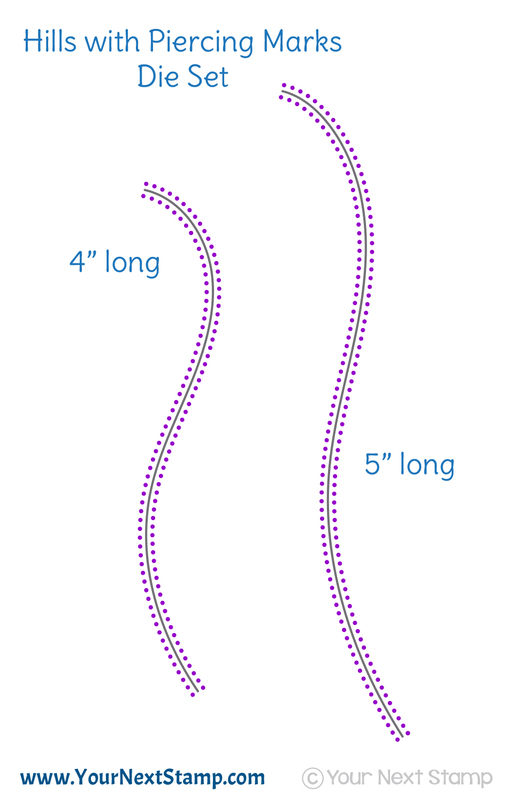 The sidewalk was made using the same hill dies. 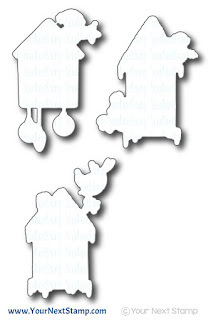 I colored in the images with Copics before cutting them out the coordinating die set and popping them up. 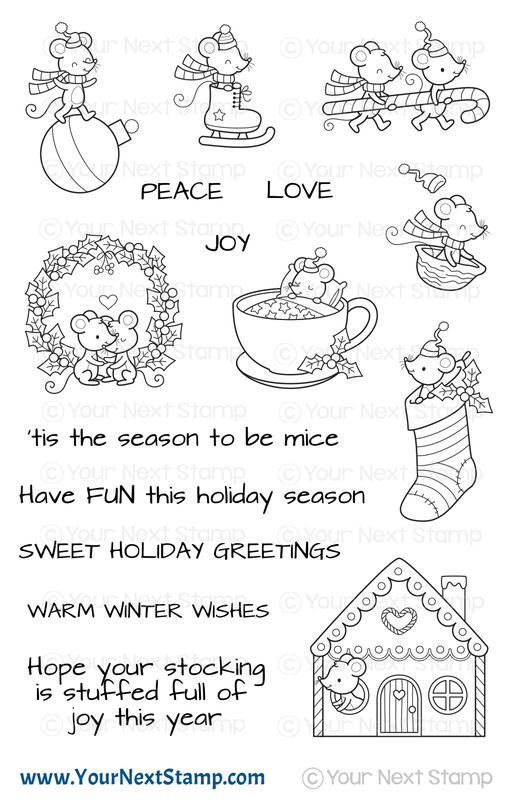 The card was finished with the sentiment stamped directly onto the top panel. 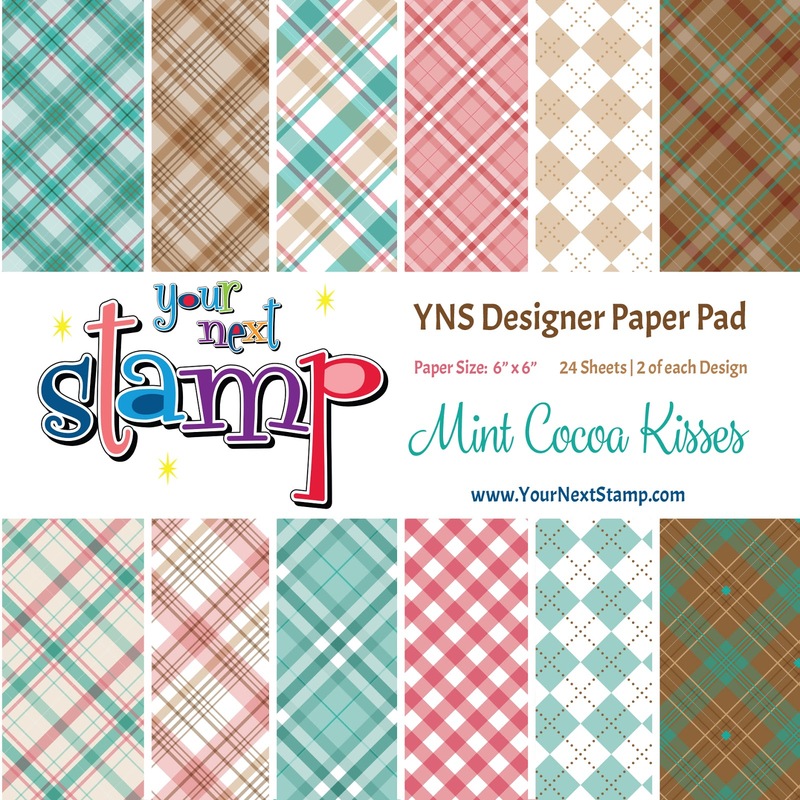 Be sure to stop by the YNS Blog to see all the sneak peeks and different fabulous sets soon to be released! Your Next Stamp Friday Challenge 99 - What's Your Sign? It's time for a new Friday Challenge with Your Next Stamp and it's all about your birth sign. The DT have created a project that represents their birth sign, whether it is their birthstone color, a holiday that may fall on their month, or even their element. For me, my birthday is on Christmas, which makes me a Capricorn so I couldn't resist a holiday card. 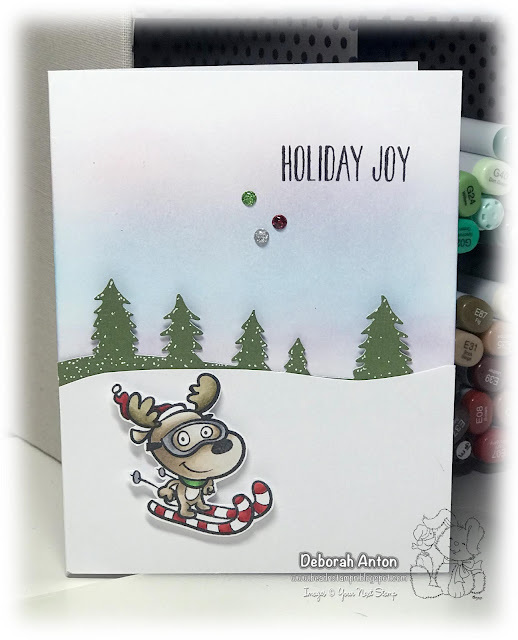 I used the adorable set of Holiday Buddies and created this scene for a whimsical look. 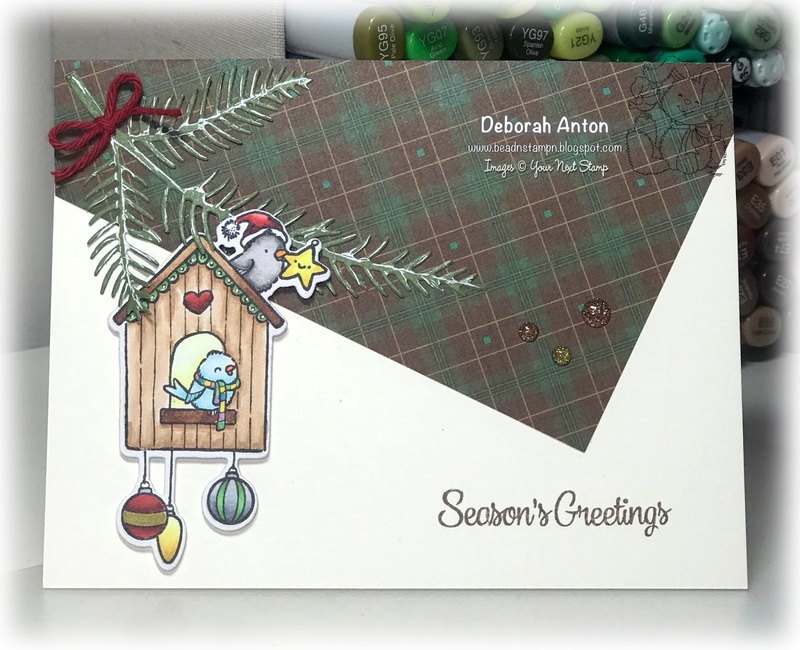 The sky was sponged in using various Memento inks while the background is cut out using the Evergreen Tree border die. 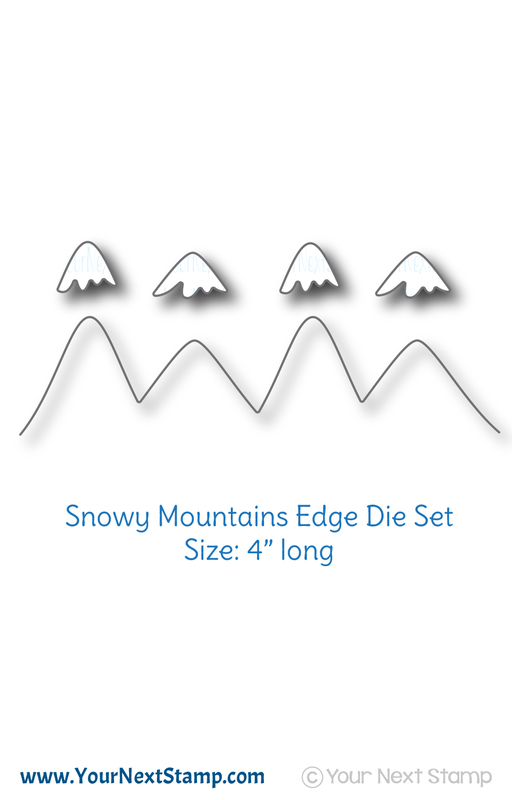 I layered over that another piece of white cardstock cut for a snowy hill. The image was stamped and colored in with Copics before being fussy cut out to be popped up. 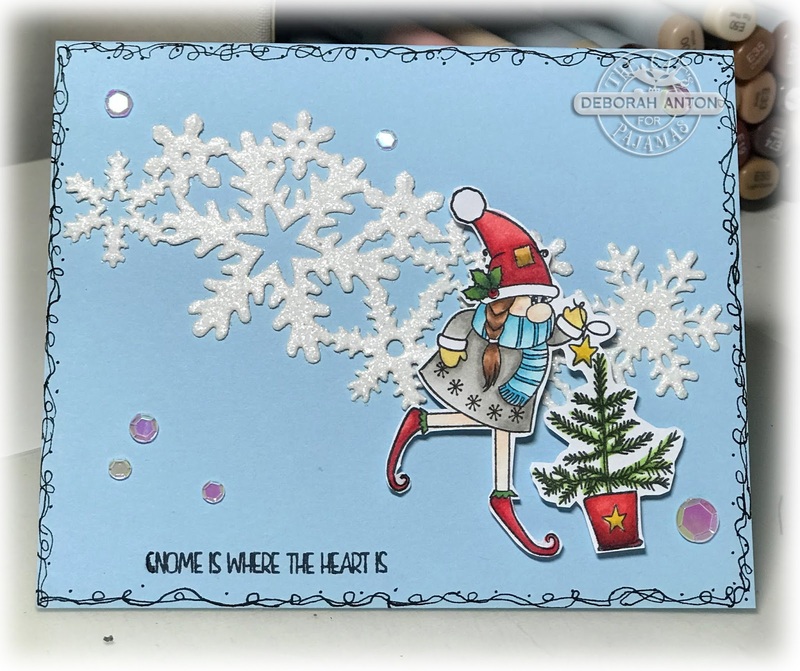 The sentiment is stamped directly onto the base of the card and the whole look was complete with a few Merry and Bright gumdrops and some added "snow" on the trees using a white gel pen. 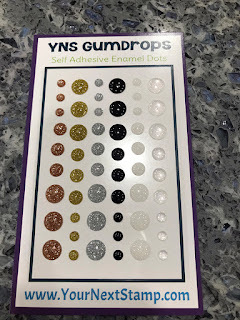 Be sure to head over to the YNS Blog to see all the super fun creations and the deets on how you can play along for your chance at winning a YNS gift certificate! Thanks for stopping by and hope you have a great weekend!